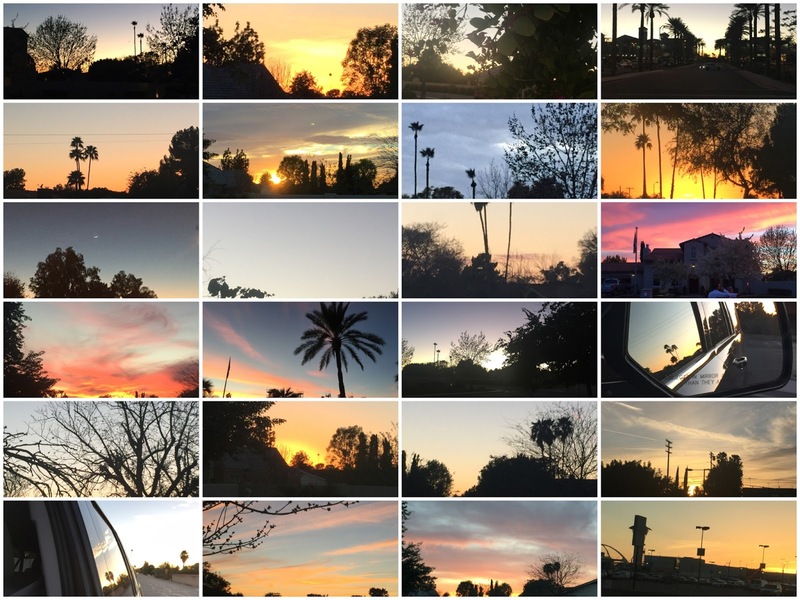 Denton Sanatorium: February Sunset Spectacular--Can You Top This One, AZ? 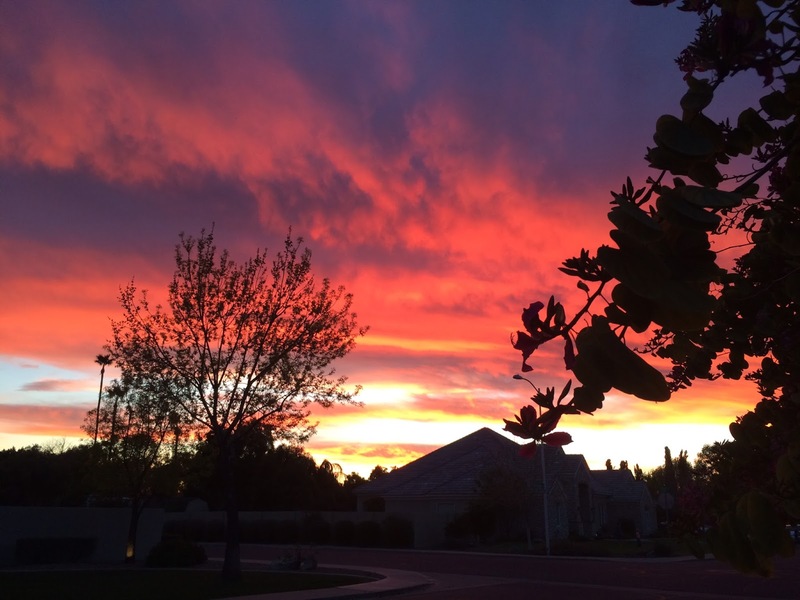 February Sunset Spectacular--Can You Top This One, AZ? Days melt into each other in our lives, and one day often looks much like the one preceding it. Or the one after it. Some of these photos are like that--can't remember what I was doing that day or where I was. I remember seeing the moon grow each night, and I recognize LAX in the bottom right photo as Lily and I began our American Idol experience. 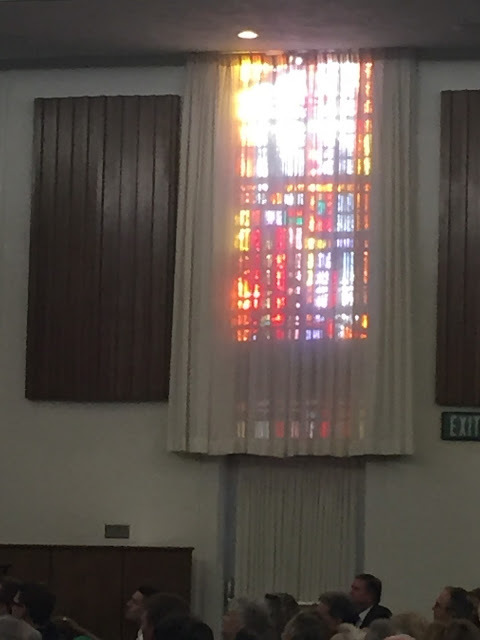 Not that this is the best picture ever, but we had a Saturday night adult church meeting, and I watched the sun go down behind this window. I don't know if I've ever done that before, and I've attended church in this building for over 15 years. Best night ever for a wedding reception. 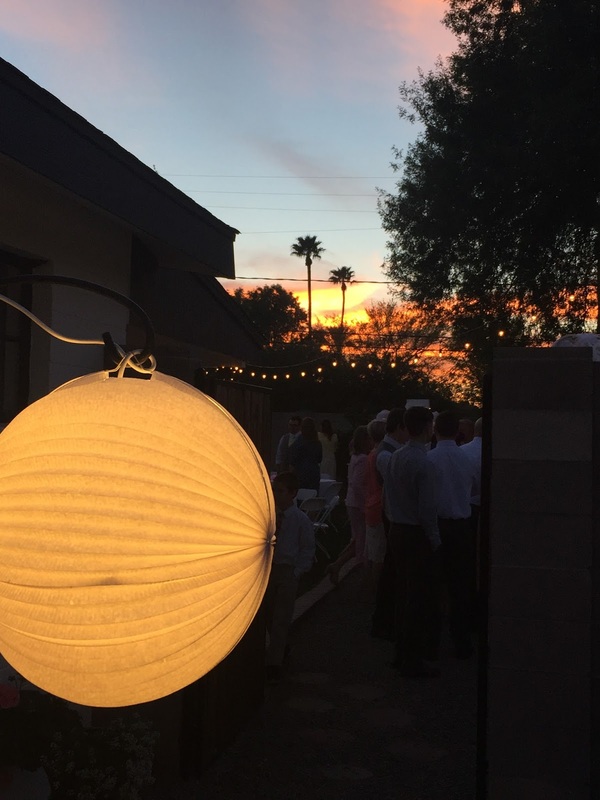 My nephew got married 2/27, and look how beautiful it was. 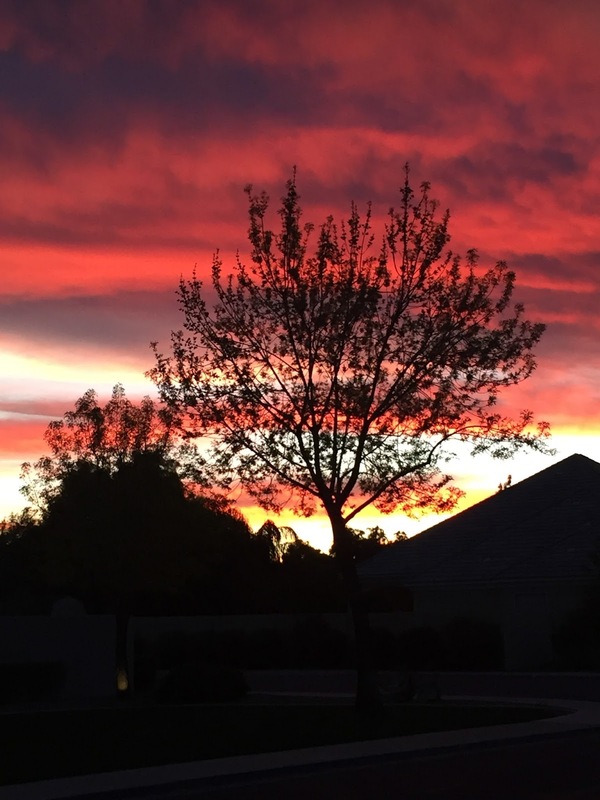 And Arizona really decided to put on a show one night. Wow is all I could say. 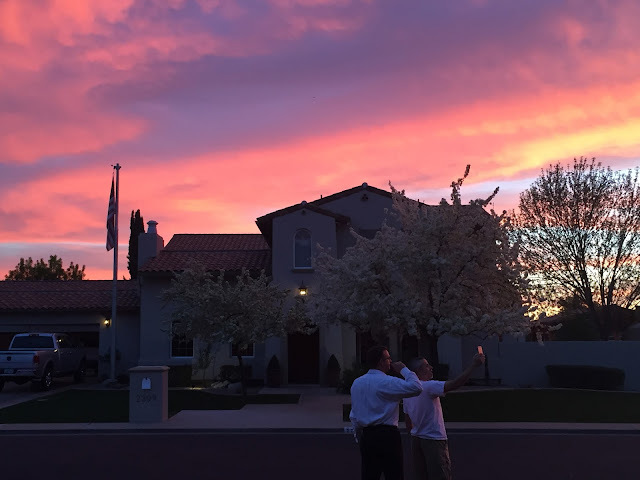 Everyone in our neighborhood was drawn outside, phones in hand, to capture this one. It turned the light everywhere pink--almost like the special effect in a movie. It was eery and cool and incredible all at once. More photos of the sky that night. Notice my neighbor's trees in full bloom. 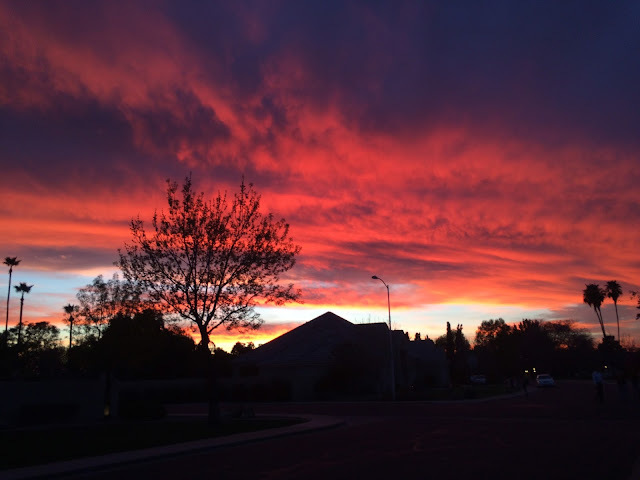 The pink light faded, but the sky burned. I don't know if I'll ever see a more spectacular sunset. What I will remember most about it is how the entire world stopped to watch it. Cars stopped in the middle of our cul-de-sac. Bikers pulled onto the sidewalk. People poured out of their homes. Just to admire God's nightly painting. I'm learning to read the sky a little better--learning when it's going to be a remarkable evening or just a peaceful close of the day. I've also tuned myself to sunset. Like a cup of chamomile tea before bed, sunset closes my day--no matter how crazy--with a moment of quiet. I'm finding I like it and that I look forward to it. I see more sunrises than sunsets, but that's because the sun rises over the beach and sets behind a hill. I do love how the sky turns the world pink. It's hard not to feel completely privileged at sch a sight. Gorgeous. Just plain gorgeous. The one at church is amazing.